After years of development Kampa inflatable bivvies are finally a reality and are set to revolutionise the way you fish. Gone are the traditional metal or fibreglass poles, replaced by strong, high pressure inflatable AirFrame poles. No more crawling around on the ground struggling with the frame and trying to link the poles, the AirFrame is already attached to the bivvy for simple, one step set up. Kampa are one of the largest suppliers of inflatable shelters in Europe and have supplied tens of thousands of products, most of them much larger and more complex than a bivvy. We are well qualified to bring you an extremely reliable andfunctional product. The best bivvy available today? It’s no good having the best and quickest set-up of any bivvy on the market unless you also have the most functional design and the finest materials, both of which the Carp AIR uses. You’ll expect your bivvy to function under a wide variety of weather conditions. 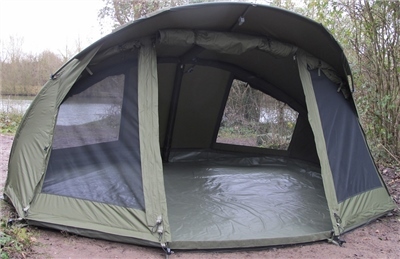 The Carp AIR uses the latest performance breathable fabric to provide the best possible environment within the tent. Weatherproofing is taken care of by the massive 10,000mm hydrostatic head (that’s 10 metres of water) and the flysheet fabric breathes, helping reduce condensation. The flysheet seams are hot air taped and all exterior zips have rain covers to protect them. The integral groundsheet is manufactured from heavy-duty PVC coated polyester that is totally waterproof and will last for years. It is zipped into the flysheet using a substantial zip, allowing it to be removed for easy cleaning. The integrated groundsheet ensures that the interior is draught and bug free, the bathtub design ensures that groundwater will not flow through your bivvy. Our zips are all heavy-duty and designed to last the life of the bivvy. We wanted to make sure that the Carp AIR was the fastest and easiest bivvy to set up and take down but we also wanted it to be the most functional and versatile. Inside you’ll find loads of room with high walls making the available space more useable. The multifunction front door offers a whole range of possibilities. It can be rolled up and stowed, it has a mosquito mesh panel and also comes complete with a velcro-on clear window. The front door also has two way zips allowing it to be used letterbox style. Either side of the door are side panels with mosquito mesh vents and these panels can be rolled to the side. The integral groundsheet is part of the set up process and means that there’s no reason not to use it. This ensures that condensation inside the bivvy is considerably reduced because moisture from the ground cannot enter the bivvy. You’ll find two large mosquito mesh panels in the rear of the bivvy. There’s four rod straps at the front and a further two on the rear. The Carp AIR is available in two sizes ‐ a Carp AIR 1, suitable for one person and a Carp AIR 2, suitable for two people ‐ or perhaps a single person on an extended trip. It’s simple - traditional poles have been replaced with an inflatable AirFrame that is always attached to the bivvy. The individual poles are linked together so that you can pump at just one single point and inflate the entire bivvy. The rigid AirFrame creates an exceptionally strong structure, probably stronger than a metal frame. It can be inflated using the supplied high volume manual pump, a Carp AIR 1 can be pumped up in less than 30 seconds using the pump supplied. What’s the set up procedure? Peg out the integral groundsheet. Attach the pump to the inflation point and pump untill inflated. The tubes are high pressure so you can’t over inflate with the pump supplied. Thread the aluminium canopy pole through the sleeve, locate at both ends and tension using the adjustable pole. That’s it! The easiest bivvy ever. Ask your dealer for a demonstratioon or visit our YouTube channel for a video of the setup. As well as being the easiest bivvy to set up, it’s also the easiest to take down ‐ just turn two valves and stand back. We provide a carry bag that’s oversized so that it’s easy to get your bivvy back in the bag and then compress using the compression straps. The Carp AIR sets up as one complete unit. Even if it’s raining the interior and groundsheet will remain dry. With no metal or fibreglass poles there’s nothing to damage your bivvy. You cannot snag your material when folding the poles. The AirFrame is always attached ‐ you’re never going to forget or lose your poles. Whilst the AirFrame is very rigid it does flex in the wind meaning that you’ll never break or bend a pole. The Carp AIR has an integral zip‐in groundsheet that can always stay attached. It provides a draught free, weatherproof bivvy and can be removed for cleaning. The Carp AIR adjusts to suit different types of terrain enabling set up in more restricted swims. What happens if the AirFrame is damaged? The AirFrame is incredibly durable and under normal conditions will not fail. Each AirPole is made of a strong TPU inflation tube that is zipped into a tough reinforced PE cover. This is then zipped into a heavy-duty polyester sleeve in the bivvy. The inflation tubes are well protected and need no maintenance. Ideal operating pressure is between 8 and 12 psi and the poles are tested to 22 psi, a pressure that is not possible to reach using the pump supplied - changes in temperature do not affect the structure and the bivvy has been tested in conditions varying from sub-zero to 40º C. Should one of the AirPoles be damaged, each AirPole can be isolated from neighbouring poles using the isolation valves. A simple repair to the AirPole or replacement can then be made. For peace of mind we offer a 2 year warranty against materials and workmanship on the AirFrame (conditions apply). Heavy duty polyester reinforced PVC bathtub groundsheet.